Why replace the entire bumper bar? Don’t replace when you can repair. SMART Paintworx specialise is dents, scratches and scuffs on bumper bars, although this is not all we do. 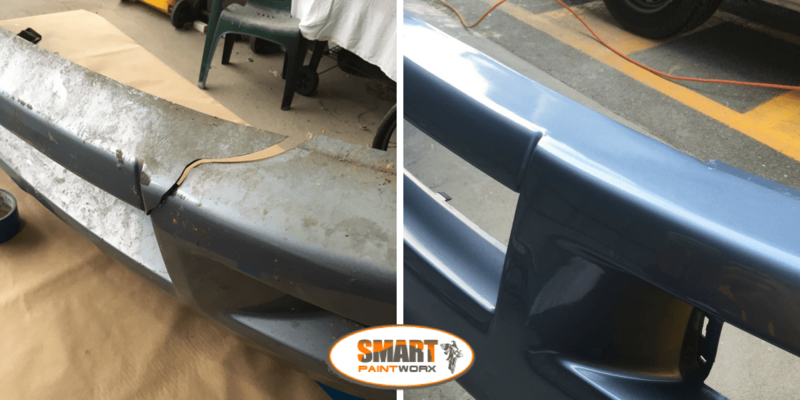 There are so many plastic parts on vehicles these days, it’s handy to know that SMART Paintworx have taken on many of the methods used in plastic welding. While we are not fully equipped with all the tools of this trade, we have taken on some of the processes to ensure a bumper bar is repaired as well as possible. Using plastic welding we are able to save you the dollars and repair splits and cracks in your bumper rather than replacement costs. SMART Paintworx repair technicians use some of the more basic methods of plastic welding such as heat, pressure and cooling to provide a finish as shown in the picture to the above. Ensuring the correct products are used is half the battle. Specialised adhesives are required in the welding of different materials. In our case we would use an epoxy plastic binder to ensure strength in the repaired area. Can we repair other plastic? Recently we were asked about a plastic water tank that had a crack in it. Before going any further it was imperative that the customer provided the particulars of the plastic. Plastic welding is not suitable for every plastic. Heat and some plastics can simply end in disaster, melting the plastic beyond recognition. Keep your money in your pocket by researching your options first rather than handing money over unnecessarily. While plastic welding can’t be used for every plastic repair, you won’t know if you don’t ask. This entry was posted in plastic welding and tagged bumper repair, plastic repair, plastic welding. Bookmark the permalink.